What type of garlic works best for bagels? I am really looking for someone with actual experience making garlic bagels. Edited to respond to a comment: I can see the following problems with adding the garlic partway through baking. (The main reason) The garlic will not stick to the outside of the bagel, since the bagel will be dry. One would have to re-wet the bagel somehow, or maybe wet the garlic? Interrupting the baking process of bread is not good in my experience. Since I cook bagels in six-bagel batches, the bagels would be out for a reasonable amount of time to add the garlic. And re-moistening the surface would further cool them. It seems absolutely absurd to have to manipulate piping-hot bagels mid-bake just to add the topping. I am positive that this is not how the bagels I have in mind are made. However, if anyone has done it this way, let me know what your results were. I've never seen the kind of garlic bagels spiceyokooko is talking about, but I am familiar with garlic bagels of the variety you're referring to. I don't usually make garlic bagels at home because I'm happier with simpler ones, but I have made some ages ago. I've usually found most things stick just fine to recently boiled bagels, but for fresh garlic, you may find it more reliable to brush an egg wash (roughly equal amounts beaten egg/water) on the top of the bagels before sprinkling on the chopped garlic. That'll work almost like cement to keep most of the garlic in place after baking. There's some possibility that the level of moisture in fresh garlic may make it harder to just press the egg-washed bagels into a bowl of chopped garlic, as you would likely do with seeds. Also, I wouldn't expect that all of the garlic will stay stuck. But with the egg wash, most of it will. As for the texture of the garlic, there's a pretty wide range of common results at the variety of bagel shops I've tried in my life; some are golden brown and some are near burnt. That's a matter of cooking time, mostly, but also the starting moisture content of the garlic. 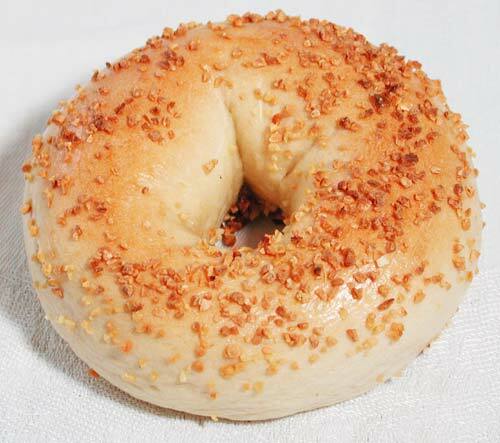 I would expect that most bagel shops use bulk, pre-minced garlic so that they can save on a little labor. This is typically a bit drier than if you fresh chopped the garlic at home. Consider buying the prefab stuff and see if that gets you closer to what you want. If it does, and you prefer to do the heavy lifting on your own, mince the garlic and let it sit on the counter to dry a bit. Another strategy altogether is to mince garlic and mix it with some oil, and smear it atop the boiled bagels with your hands. I think this should stick reasonably well, and will affect the texture of your result. Since I'm not 100% sure what your platonic ideal is for the garlic texture, I can't say whether the oil-mixture or egg wash route is going to be a better choice, or some hybrid, but those are some options to explore that I think will get you closer to your target. The garlic on the outside is the fast food version and the garlic on the inside is roasted garlic that dissolves into the dough (the later being the original garlic bagels that were in the deli's before bagels became mainstream). To make the fast food version use the dried granulated garlic - and you need bagel boards so it will not dry out. To make a bagel board use just a piece of 2x4 that will fit onto you baking sheet. The board is then covered with what looks like a strip of burlap called a Jute webbing, you can use a stapler to attach it to the bagel board. The jute webbing should be wet when you but your boiled bagels on it, and they should be upside down / seed side down. To make sure your garlic does not burn, bake your bagels at 500 degrees and usually you will flip the boards over and remove the bagel boards after 7 minutes - in the case of garlic leave them a little longer on the bagel board. Remove when your garlic is getting toasty. Or to the color that you like them. Personally I always enjoyed the deli version that looks just like a plain bagel or, as we called them, a water bagel, but it was a garlic bagel. I was very surprised when I first saw a garlic bagel at the shop I was a baker at that just sprinkled the garlic on the top. To many like me, that is not a real garlic bagel. Try the real kind: Roast a head of garlic in the oven for 40 min. It will now make a wonderful roasted paste. Experiemnt with the amount of garlic that you like. Add it in the last 2 minutes of kneading the dough, don't add it to the water, this is the same way with any added favor. Well to make the bagels like the one in the top picture first you have to dice/mince fresh garlic..you can buy the jar but need to place them in between paper towels and place in fridge or elsewhere to dry out some. You want all visible liquid gone and the towels should be dry. Then you boil your bagels like normal when the come out and are on the pan for the oven you brush them with an egg wash (scrambled egg and salt). i found it easier to place the bagel upside down onto the garlic and then back on the pan. Bake as normal..Enjoy !! You can't make garlic topping bagels without the specialized revolving gas ovens you find in NYC bagel shops. These are needed to upturn the bagels from a peel while it is baking. The garlic is applied after they are turned upside down. Not the answer you're looking for? Browse other questions tagged bread garlic bagels or ask your own question. What are other techniques to make garlic bread? Can I use garlic leaf for cooking?